The metropolitan area of Caracas is divided into five municipalities : Libertador, that preserves what remains of the colonial part of the original city; Chacao, a dynamic zone that has the greatest number of hotels, banks and modern office enters; Baruta, distinguished by its cosmopolitan urbanization of Las Mercedes; El Hatillo a picturesque that reminder of a bucolic past; and Petare with its heritage of a small colonial town. Location : Venezuela is a Caribbean, Atlantic, Andean and Amazonian country, located in the tropic north of South America. With 916.445 sq. kms, it is considered one of the richest countries on biological diversity. The World Wildlife Fund classifies it like one of the six countries more diverse of Latin America and as ten first in the world. Topograpy : Its diversity derives from 2,718 kms of Caribbean coast, 1,008 kms of Atlantic coast, the Andes in the west, in the southeast the Guyana Massive and running through the majestic Orinoco River. It offers four distinctive natural reins: litoral: mountains, seacoast and insular areas; the Andes, the Plains, Jungles, Savannah and Guayanese Massive. With a population estimate in 23.700 million inhabitants, Spanish is the official language. 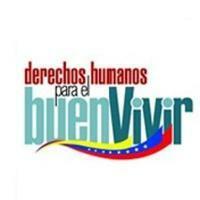 English also is taught as mandatory second language in the Venezuelan educational system. Roman Catholic is the majority's religion, but other faiths are practiced as well. The climate is tropical to moderate. The temperature changes are slight. There are only two seasons in Venezuela, rainy and dry. The cooler weather prevails from November through February, particularly in higher altitudes such as the Andes and the Coastal Range in which Caracas, the capital, is situated. The hottest months are July and August. The national currency is the Bolivar. The largest lake in South America, Lake of Maracaibo (52.000 km2); the highest waterfall in the world, the Angel Falls (979 mts) and the third largest river in South America, the Orinoco river (2.060 kms). 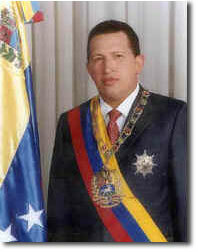 Hugo Rafael CHAVEZ FRIAS was born in the town of Sabaneta, State of Barinas, Venezuela, on July 28, 1954. At Venezuela's Military Academy he obtained a College-level degree in Military Sciences and Arts, Engineerign Branch, Ground Specialty, graduating as a Second Lieutenant on July 5, 1975. Risking everything at the head of a movement of young officers of the Armed Forces, Hugo Chavez rebelled on February 4, 1992 against a social and political order mainly characterized by corruption and injustice. On February 2, 1999 Hugo Rafael Chavez Frias after won the presidential election on December, 1998, took over the reins of the State to lead the nation's destiny. With a new Venezuelan constitution adopted in 1999, there was a new presidential election that he won, and allows him to stay in power for six more years.